Freaking love this! I could seriously have this for every meal of the day! I actually made a frittata recipe recently and I used all these lingering veggies I had in the fridge. It was the perfect way to use them up instead of letting them rot in there. They’re such an easy way to use up all those odds & ends for sure! I have never made a frittata like this before! Looks wicked good! I am a big fan of making them at the end of the week when I have a ton of veggies that need to be used up before my next shopping trip. I am definitely in need of some healthy delicious food in my life! I love this rice crust! And all the veggies! Wish I could reach into my screen and grab a slice. I love how creamy it looks! What a fun idea! 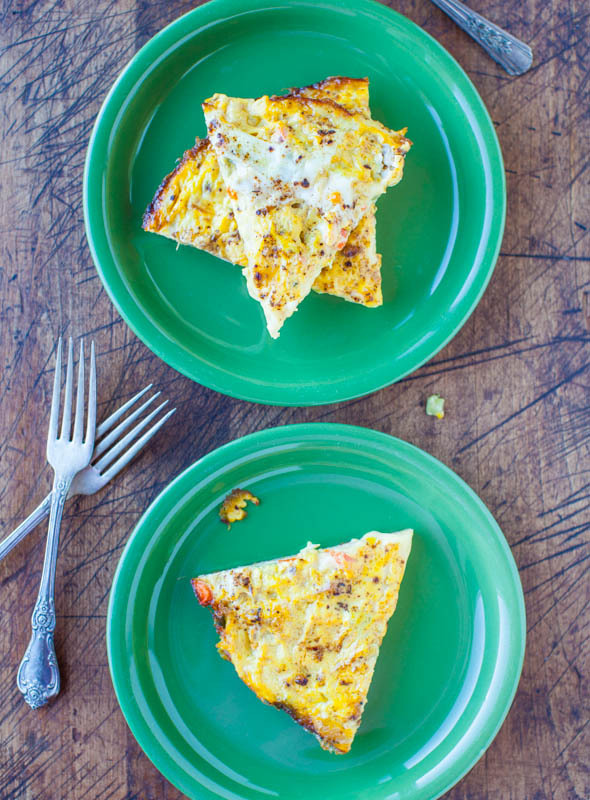 The creaminess of this frittata is definitely calling my name! I like the change of pace around here, there’s only so many cookies one can bake and eat! Plus, I’m more of a savory food person than sweets anyways. This looks delicious. 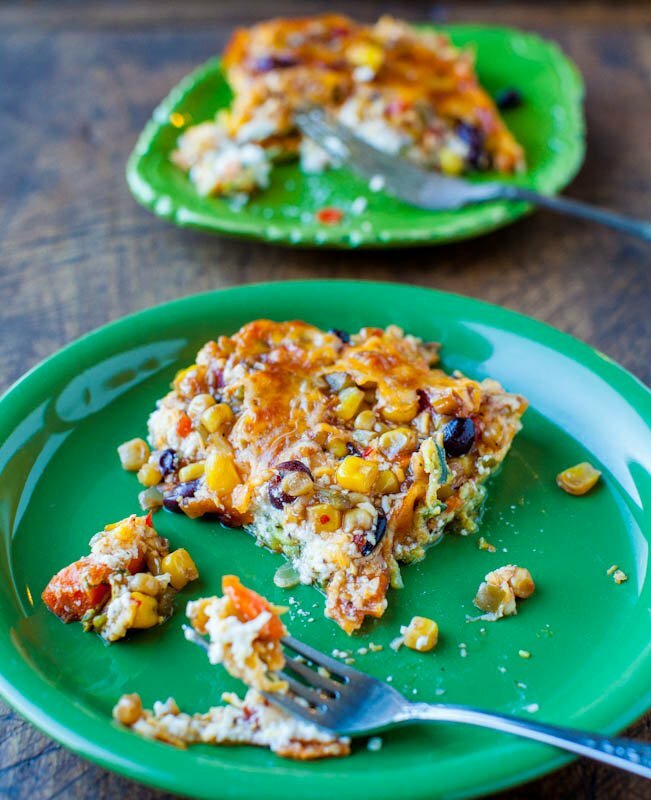 I rather like dishes served up in the shape of a pizza too ;-) I recently made a vegan frittata using silken tofu. It turned out incredible. My sister (not veg) wanted the recipe even. I added in a splash of apple cider vinegar and it gave it a very rich, buttery taste without any butter. A splash of ACV on anything is perfect to me! Packaged fried rice? What will trader joes think of next? I love the idea of adding a creamy soup to this. It could easily be made dairy-free with a different type of base. Love it! I think my favorite way to enjoy eggs is soft boiled style so that the insides are still runny and can be soaked up with toast. Mmm! It’s frozen and it’s like 1.99 for a big bag. It’s so easy because I can literally unthaw 1 cup or whatever we need in like 5 minutes and it just saves so much time. And it’s already seasoned and ready to go for dishes like this! 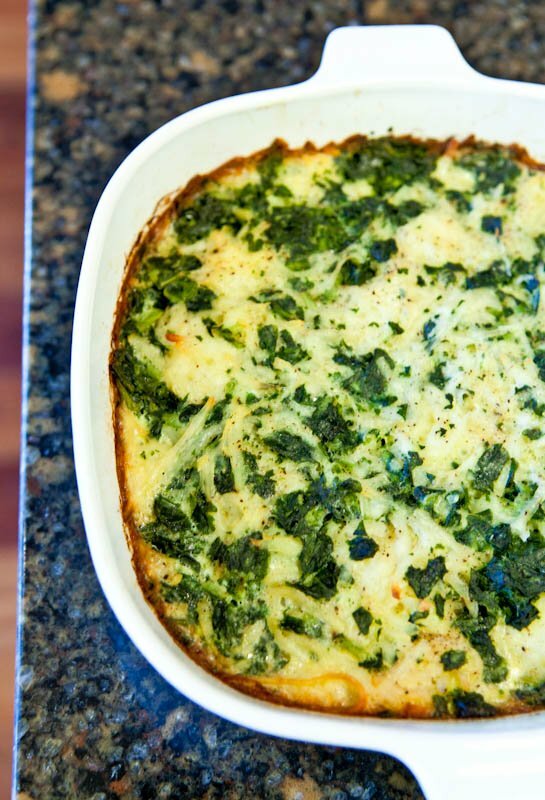 This looks like a great dish that could last for many meals around my house! I’ve been making a lot of eggy dishes with polenta lately – I wonder if I could do something like that here? Trader Joe’s really does carry everything you could ever need. Every time I go in there I discover some new amazing product. It’s hard to keep my money in my wallet there! I almost never use polenta (thanks for the reminder) and yes you could just swap that in for the crust/base. 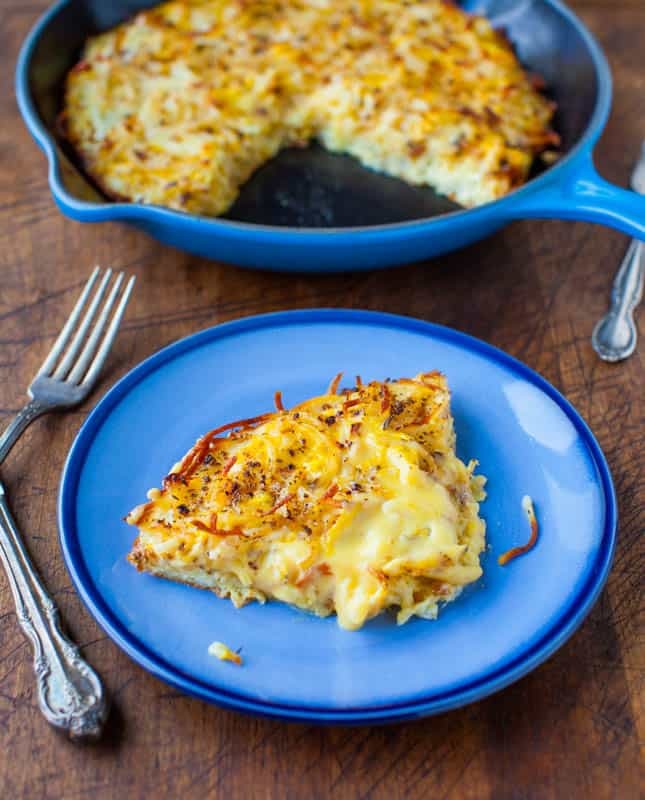 Really just about anything with a few cracked eggs and some creamy soup on it will work…I’ve used leftover spaghetti noodles as the base, leftover spiral pasta noodles, hash browns, you name it! I don’t know who you are, making me think that vegetable mess up there looks delicious, but stop that. Stop that right now. Lol and I think even the most vegetable-resistant types may even get on board with it! 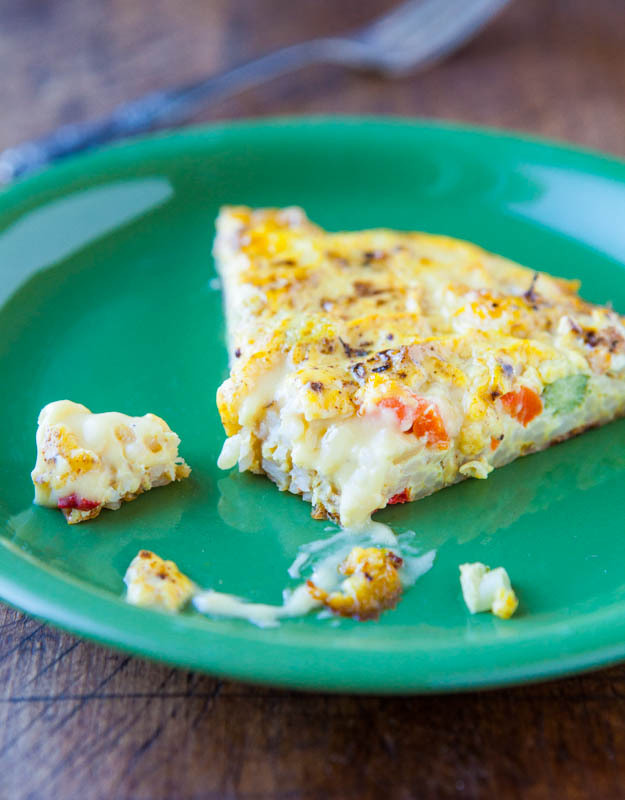 I love a veggie-packed frittata, this looks fab! 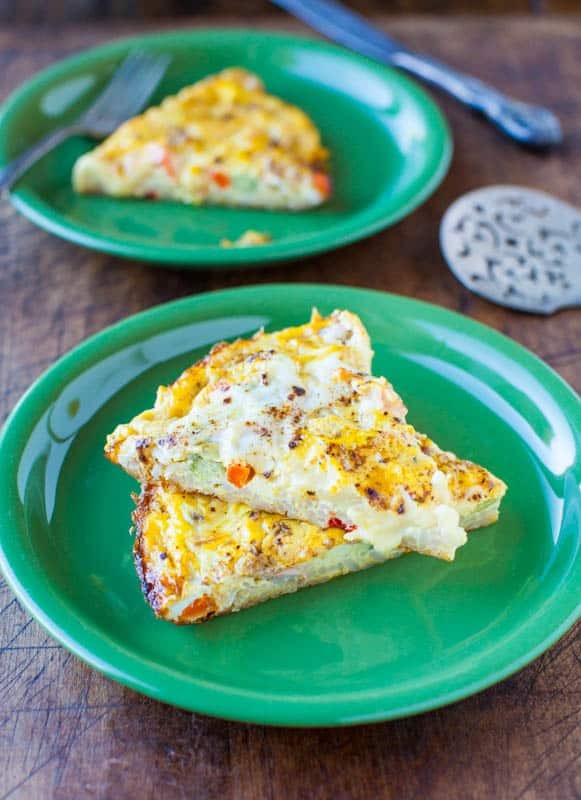 Frittatas and veggie bakes are the best “meal savers” for time and ingredients. I like the soup in there–it adds extra creaminess. I think I’ve made all of the related recipes except the spicy eggs and hash browns! All excellent, and the sweet potato fritters were definitely a favorite of my husband’s. We just finished lunch (your pepperoni pizza–I used crescent rolls and I put the pan out on the gas grill). It’s about 19 degrees out so I gave myself a big pat on the back for pulling it off. The base would have baked more evenly in a real oven, but it worked! 19F out and you’re grilling. Bless you! That reminds me of my parents who live in MN and will grill in that kind of weather and until it’s nearly freezing, my mom hangs clothes on clothelines to dry! Glad you enjoyed the pizza and the C.R. dough and all those related recipes…wow! Thanks as always for making all of it! 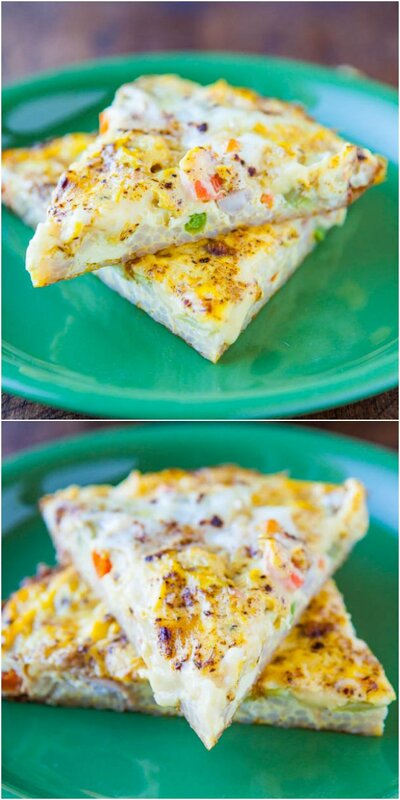 I love the versatility of frittatas! This one looks great, and I think I could get my meat-loving husband to have this for dinner! The heartiness from the soup and eggs sounds perfect. And I love, love how quickly it all comes together! Loving your dinner ideas on here – you’re so creative! And you can always toss in meat, too. I just opted to keep it vegetarian. 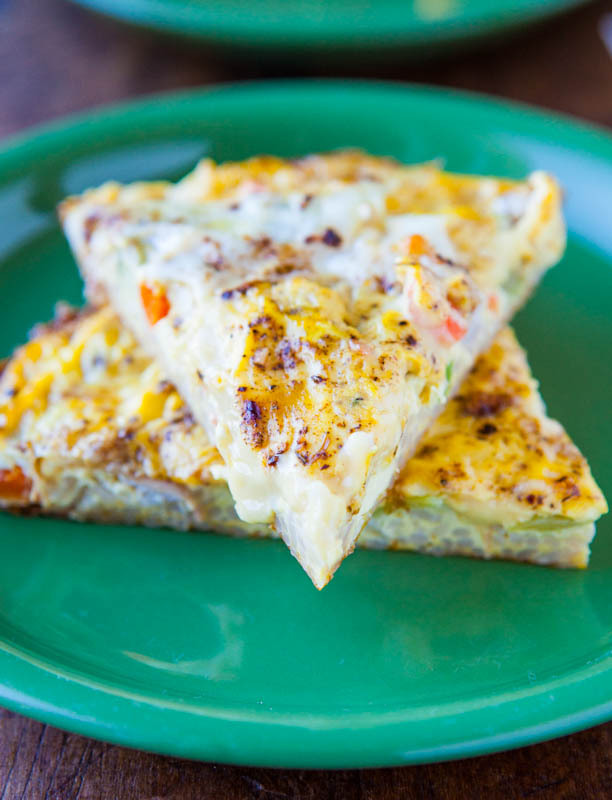 Love frittatas because they’re so flexible! Brinners. Breakfast-for-dinner are the best. And yes on the leftovers! And I loved that egg dish of yours the other day, which I saw on the food sites! I knew I had just made this but want to try yours! 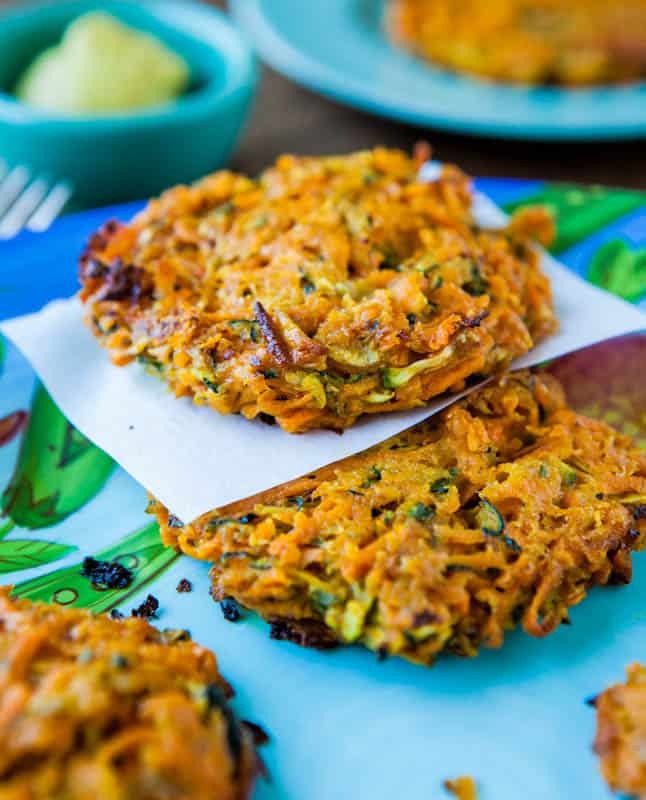 I never have trouble sticking veggies in my meals, but it is ALWAYS wonderful to find new recipes using them. And you never shy away from giving us unique recipes with my beloved veggies, Averie. This dish would undoubtedly be good with any protein – but I feel like tofu would shine. I love tofu in my scrambled eggs. 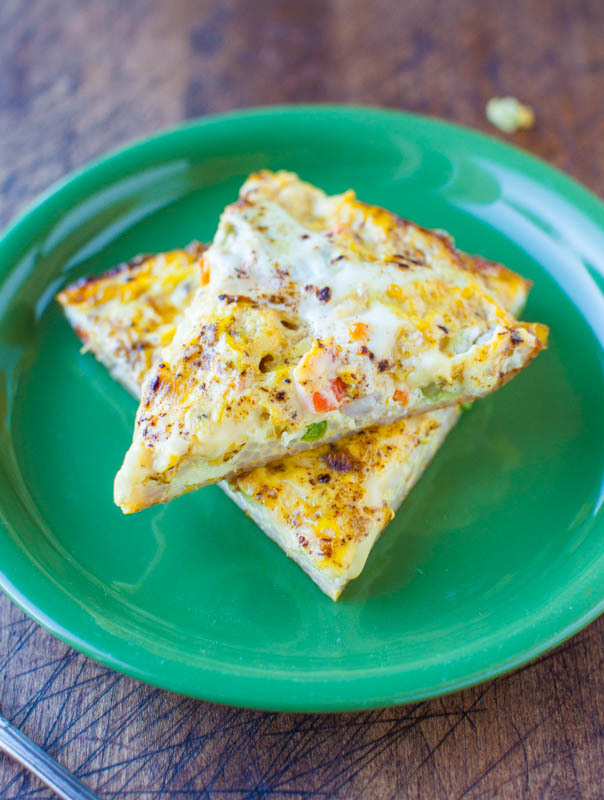 :) Frittatas are so easy and fun to make – the options are endless. I don’t make them enough! And like Skylar, i LOVE the pizza shape!! Did she dip this in ketchup? Please say yes! Omg I DID give her ketchup with this one! Trust me, both she and I are major fans! Tofu in scrambled eggs…I need to resurrect that combo. I used to do it a lot! 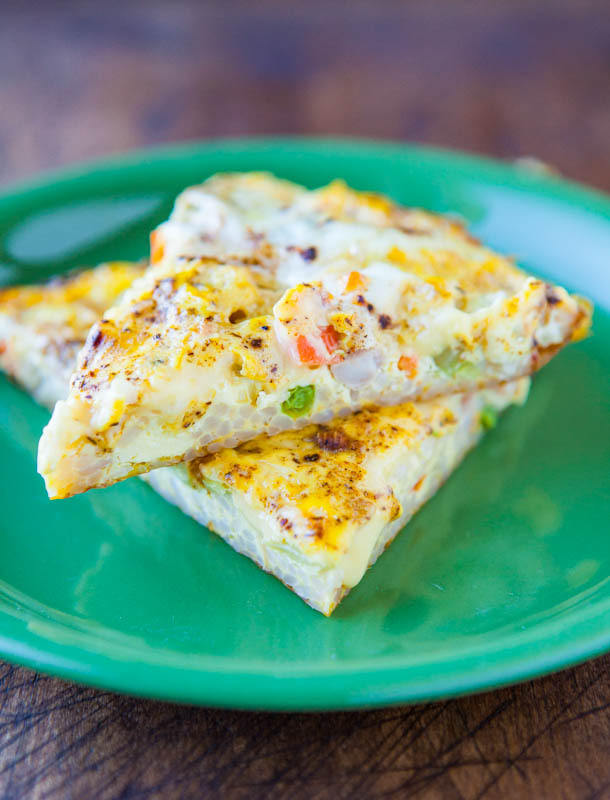 I make fritattas for breakfast quite often (5 eggs, 1/4 milk, approx. 1 cup chopped veggies, approx. 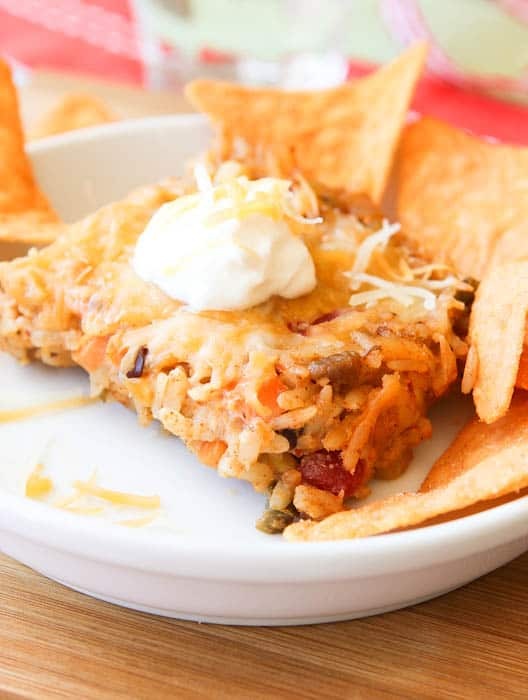 1/2 cup or more shredded cheese, s&p). I soften the veggies up in a cast iron pan on the stove for a few minutes (in butter), and then dump in the eggs, milk and cheese. Once this has started to set a bit (2 minutes maybe) I put it in a 350 F oven for 8 minutes. If still jiggly, then I broil for a minute or two. I have seen those cinn rolls of yours on every food site. And I keep thinking about them. And about the potatoes in them. And vacillating if I should just go for it…they just look so incredible! Bring on the veggies! 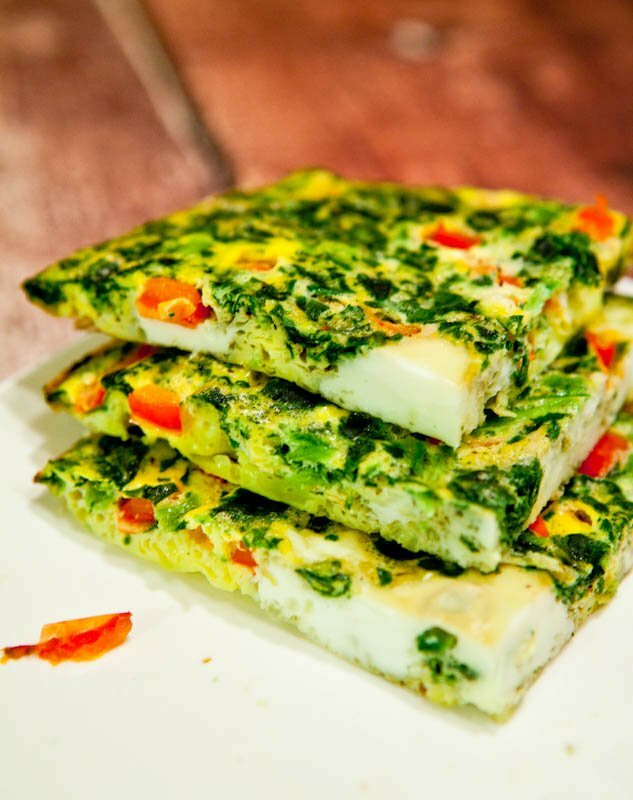 These flavors are so fun for a frittata! Good job lady! I love me some veggies! Can’t wait for dessert though. I know you have something ridiculously rich and tasty coming our way soon. Oh, gurrrl, you got me! Especially with that fried rice thingamajigger. That is genius! I keep seeing ALL your pics on every food site, on every pin board I go to…seriously girl I want it all, too! It all just looks amazing!